The history of Williamsport has mirrored the history of our nation – a wilderness area tamed by brave pioneers, transformed by industry, hardened by war and natural disasters, always looking forward with an optimism for which America is famous. Williamsport’s story also reflects the importance of transportation to our nation’s development. This influence was particularly profound in Williamsport because of the area’s natural location as a crossroads of routes to the expanding West. Before the highways, before the railroad, before the canal, before the town, there were crossroads. The Williamsport area, nestled between the broad waters of the Potomac River and the Conococheague Creek, was a natural pathway for our nation’s first inhabitants, the Native Americans. The Algoquins, Kruskaraw, Wassa, Womenkes, Iroquois, Delawares and Catawbas Indians passed through this area. The first non-Native Americans to record visits to the Williamsport area included Indian traders and included a young surveyor named George Washington. The first settler was Israel Friend in 1732. The first wave of permanent settlement took place during the late 1700s by families coming from Pennsylvania, many were German farmers who purchased small farms for raising wheat. The many grain farms led to the building of many flour mills as well as many whiskey distilleries. The stage was set for the birth of a new town. That spirit arrived in 1787 in the person of Brigadier General Otho Holland Williams, a Revolutionary War hero and compatriot of General George Washington. 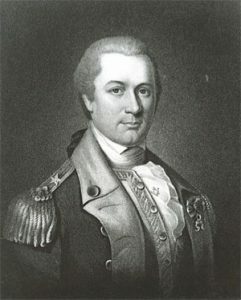 He had grown up in the area that was soon to become “Williams’ Port,” after the Revolutionary War he purchased large tracts of land to lay out a grand city on the Potomac. He ordered that the main streets be not less than sixty feet wide. This indicates his desire that it would be selected the Capital of the new Nation. President George Washington favored a site on the Potomac River, and visited Williamsport October 14, 1794, as part of a tour of several potential Potomac sites. Although he did not choose Williamsport, the town continued to flourish. As the young Nation expanded south and west, the need for better, faster means of transporting goods and people was critical. The solution was creating canals, locks and aqueducts to carry boats filled with goods and coal. The C&O Canal was built to make the Potomac a navigable path from Georgetown future North (Cumberland). The C&O Canal brought a “boom” of prosperity to Williamsport – warehouses, shipping firms, sawmills, small factories were established, town businesses and population expanded. Williamsport became a true “canal town” and its citizens earned the nickname of “River Rats”. Today Williamsport is part of the Canal Towns Partnership and works closely with the C&O Canal National Park. Williamsport aqueduct and in 1924 the canal ceased operations. In Williamsport there are more remains of the working canal – Lock 44, Lock House 44, Bollman Bridge, Lift Bridge, Turning Basin at Cushwa, and the Aqueduct. Restoration has begun on the working Lock 44 and Lock House 44 will be a museum showing a life of a Lock Keepers family, Bollman bridge has been restored and the next will be raising the track at the Lift Bridge, Canal Water filtration, Cushwa Warehouse, Trolley Barn for a visitor center and restoring the Aqueduct, adding a Launch boat for tours on the Canal Section in Williamsport. Williamsport’s location made it an inevitable crossroads to battlefields for both the Union and Confederate armies. Troops from both sides were ferried across the Potomac. The Union army occupied Springfield Farm as a campsite, erected a signal tower and chopped down many of the estates fine trees. In June 1861, General Abner Doubleday erected a breastwork of cannons in Williamsport on what is now known as Doubleday Hill overlooking the Potomac and the C&O Canal. In 2013 Williamsport restored the original cannons and brought them back to Doubleday Hill on carriages, they are part of the new Civil War Walking tour. General Robert E. Lee crossed at Williamsport on his way to Gettysburg, after the Battle at Gettysburg, Lee’s army Retreated through Williamsport but was prevented from crossing into Virginia due to the heavy rains and remained in Williamsport for several days with over 400 wagons of wounded. Every church and most buildings were used as hospitals, battles were held while they were stranded in Williamsport. Williamsport families’ property was seized by both, Union and Confederate, armies, their lives disrupted, their loyalties divided. Churches were used as makeshift hospitals and residents called upon to nurse the wounded and dying. The Civil War was a constant presence for Williamsport, and had a lasting impact on our people. Retreat through Williamsport 151 years will be re-enacted at the Springfield Farm on July 11-13, 2014. Williamsport recovered after the end of the Civil War, with the arrival of the Western Maryland Railroad line boosting industrial development in the area. The population of the town grew, banks, stores, churches, schools, newspapers, fraternal groups and other community institutions also flourished during Williamsport’s most prosperous period. The automobile, highways, interstates connecting Williamsport with parts of the state and the nation, enabled new businesses and new groups to move to the area. After WWII the fortunes of the town slowed as Williamsport became increasingly “suburbanized.” Plant closures, improved highway transportation and the decline of family farming with people working at jobs in nearby areas. The restoration of the C&O Canal by the National Park Service promises to provide a new industry for the town – Tourism. Williamsport today is at yet another crossroads in history – a small town connected by superhighways to the pulse of the nation!